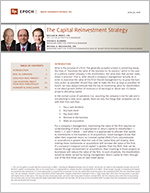 The Capital Reinvestment Strategy - Epoch Investment Partners, Inc.
What is the purpose of a firm? The generally accepted answer is something along the lines of “maximize the value of the business for its owners,” which in the case of a publicly traded company is the stockholders. But what does that answer really mean in practice? That is, what should a company’s management actually do in order to maximize the value of the firm? Should management try to grow the business as fast as possible? Should they seek to make the firm as large as possible? At Epoch, we have always believed that the key to maximizing value for shareholders is not about growth (either of revenues or of earnings) or about size; it’s about properly allocating capital. For a company’s management, maximizing the value of the firm requires an understanding of when it is appropriate to return capital to shareholders — items 1, 2, and 3 above — and when it is appropriate to allocate that capital to investments in the business or to acquisitions. Good managers know that when their expected return on invested capital (ROIC) from reinvestments or acquisitions is greater than the cost of the capital they will employ, then making those investments or acquisitions will increase the value of the firm. If a company’s marginal cost of capital1 is greater than the ROIC that can be earned through reinvestment or acquisitions, then investing in those projects or businesses will reduce the value of the firm. In such situations, the shareholders would be better served by having management return capital to them through one of the first three uses of cash listed above. We should note that these two broad categories for the uses of cash — i.e., return it to shareholders or invest it — are not mutually exclusive. Many companies will find that they have some projects that merit investment, but not necessarily enough to use up all of their free cash flow. For these companies, it makes sense to invest in some projects while at the same time returning some of the free cash flow to shareholders. Epoch’s investment process has always focused on this issue. The first question we ask a company’s management is “what is your policy for allocating capital?” Our Global Equity Shareholder Yield strategy has focused on companies that are returning a sizable portion of their annual free cash flow to their shareholders. We have never had a particular bias as investors toward those companies; rather, our bias is toward companies that have sensible capital allocation policies. Capturing the “shareholder yield” uses of free cash flow in a systematic way is one way to implement our investment philosophy. What about the other two uses of cash — reinvestment and acquisition? Is there a way to systematically identify companies that are properly allocating capital to these two areas? And if there is, would a portfolio of such companies be likely to generate superior returns? We believe the answer to both of these questions is “yes,” and have created our Capital Reinvestment strategy to capture what we believe are the superior investment results that can be achieved by focusing on companies that are generating premium levels of ROIC. Why do we believe that ROIC matters more than growth? Do companies with high ROIC generate superior returns to shareholders? We’ll start with the first question. It is worth taking a moment to focus on the difference between the concepts of average and marginal, both with regard to the cost of capital and to return on investment, and on why that difference matters. You will often hear that a company should invest only when the return on a potential investment is greater than the firm’s “WACC,” or weighted average cost of capital. WACC is just what it sounds like: the weighted average of the cost of the company’s existing equity capital and debt capital. The cost of debt capital is easy to measure – it’s the interest rate that the firm has to pay on its debt. If a firm has multiple debt issues outstanding (including bank loans), each with a different interest rate, then its weighted average cost of debt is the average of the interest rates that the firm is paying, weighted to reflect the size of each borrowing. The cost of equity capital is harder to observe directly, since a firm is not required to make cash distributions to shareholders. But that does not mean that equity capital is free. Even if they do not receive dividends, equity holders expect to earn a return on their investment through the appreciation of the stock price. So the cost of equity capital is usually thought of as the expected return on equities in general, adjusted for a firm’s equity beta (i.e., its level of systematic equity market risk). Higher-beta firms are thought of as having a higher cost of equity capital, while lower-beta firms have a lower cost of equity capital.To better understand why the distinction between “average” and “marginal” matters, consider a hypothetical example. Suppose a company has a capital structure consisting of 80% equity and 20% debt, with a total enterprise value (i.e., equity plus debt) of $1 billion. The debt has a weighted average interest rate of 5%, while the equity cost of capital is assumed to be 10%. The firm’s WACC will therefore be 9%. The firm has a single line of business which is earning a 14% return on the invested capital, 500 basis points over the WACC. Now suppose that the firm is considering making an investment in a new line of business that will cost $200 million, and plans to fund the project entirely with newly issued debt. Interest rates have fallen, and the firm can now borrow at a cost of 3%, rather than the 5% it is paying on its existing debt. The firm believes the new business will earn a return on investment of 8%. Should the firm go ahead with the investment?From the perspective of average cost of capital, this does not look like a good investment. The firm’s existing WACC is 9%, so an 8% return would be 100 basis points below that; using 9% as the hurdle would make it seem that the project will destroy value for the company. But the project will not be funded by the firm’s existing capital; it will be funded by the addition of $200 million in debt, which will cost 3%. The 8% return on the project will be 500 basis points higher than the cost of the capital being used to fund the project, the same spread as the firm is earning on its existing business. So the company will in fact be creating value by taking on the investment. In evaluating a prospective capital investment, it is the cost of the marginal capital employed that matters, not the average cost of all of the firm’s capital. Similarly, it is the marginal ROIC that matters in this situation, not the average ROIC that the firm earns on all of its businesses combined. To see why, suppose that instead of earning 8%, the new business was expected to earn only 2%. If the firm goes ahead with the investment, its average ROIC would drop from 14% to 12%. (It would have $1 billion in capital earning 14% and $200 million in capital earning 2%; that produces a weighted average ROIC of 12%.) In addition, of course, adding the $200 million in debt costing 3% would change the firm’s WACC. As a first approximation, ignoring any impact on the cost of equity capital, the debt would lower the WACC from 9% to 8% thanks to its low interest rate. But if we assume that the added leverage raises the firm’s beta, and hence raises the cost of the equity capital to 11%, the net effect on WACC would be to lower it only to 8.7%. Since the new average ROIC of 12% would still be higher than the firm’s new 8.7% WACC, does that mean that the investment makes sense? The answer is no, because the firm would be borrowing new capital at a cost of 3% to fund an investment that would earn 2%. That’s a formula for destroying value. It’s the marginal return on capital that matters in evaluating new projects, not the average.